Hi I'm new to bith the forum and Bonsai. About three weeks ago I found a Juniper over at a goodwill that was sitting with the fake trees. When I inquired about the tree the clerk at the store told me that it had been sitting there for roughly 3 months with no one ever so much as looking at it so I bought it. I brought it home, gave it some water and did a little research. The Juniper perked up a bit and seemed to be looking better. I noticed that the previous owner used a hard foam sponge rather than actual soil. After seeing this I made sure to flush all the built up sodium out and the tree really sprung to life but over the last few days I've noticed the greener the tree seems to get the more and more yellow needles start appearing. I would guesstimate that about 25-30% of the foliage is yellowish but the needles are not brittle. I only have one picture of the tree at the moment but will try to get some more to show the condition of the tree. I must admit this is one of the more unusual posts we've had in a while. At first I thought you meant that it had been totally neglected for three months but that would surely not be possible as it would be long dead by now. Someone at the store must have paid at least a little attention to it. I noticed that the previous owner used a hard foam sponge rather than actual soil. Next, I have never heard of a live plant being grown in florists foam, which is what I assume you mean by hard foam. I have to wonder if it is even rooted at all. A Juniper can appear alive for some time after it has expired, or has been cut. Could it be that this is not actually a live plant but a large cutting, so to speak, that has been secured in a pot but is not actually potted? Are the rocks glued in place? This is another trick used to secure poorly rooted material temporarily until it becomes established or dies, whichever comes first. I don't mean to sound pessimistic and I hope I'm wrong as it looks to be better material than is usually found at retailers. Are you aware that Junipers should not be kept inside? Many have tried with the vast majority failing. So that's the first thing I would suggest, keep it outside in a spot that does not receive direct sun, except perhaps in the morning. Mist it frequently to help check the needles from becoming dehydrated an more than they already have. Re-potting will definitely be in it's future but I hesitate to suggest that since you are a novice and the tree is obviously in distress. On the other hand the foam situation is disconcerting and not appropriate at all. This one is a real puzzler. Does anyone else have any thoughts? 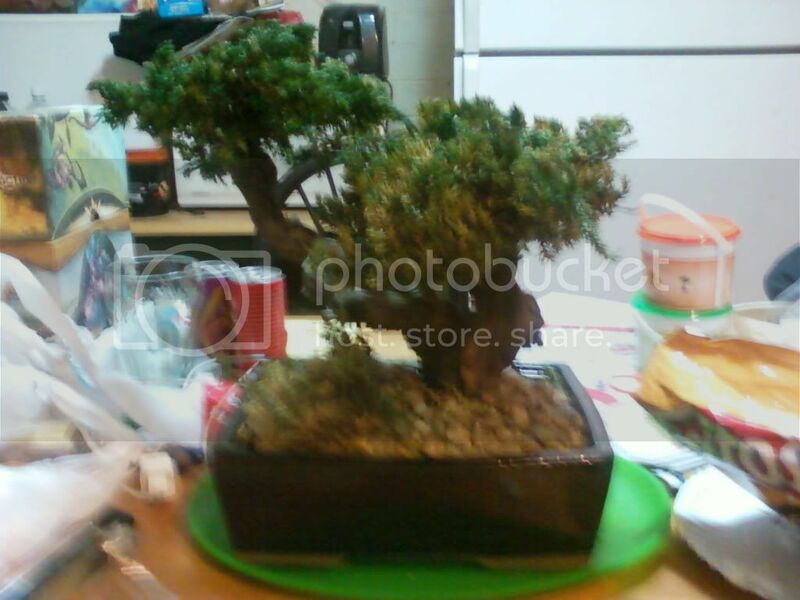 kiatsu - I do hope that your juniper is more real than this and actually has roots. It will need to live outdoors as Norm indicated. Junipers are not indoor houseplants. Please let us know more. Is my Juniper dead or is there anything I can do to save it? Juniper Bonsai Yellowing - How to Save it? Please help save my Bonsai!